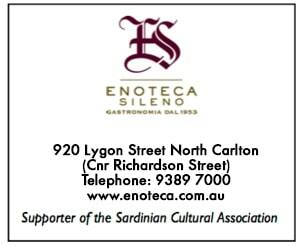 "As can be seen from these photos, a great enjoyable time was had by the many who recently attended the convivial lunch, showcasing the best of both the Tuscan and Sardinian Region's cuisines, on the occasion of the “THE FEAST OF THE HOLY CROSS/ LA FESTA DELLA SANTA CROCE". 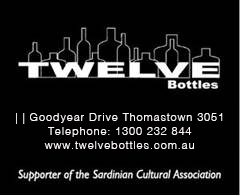 For the third year running, the event was organised jointly by the Toscana Social Club (TSC) and the Sardinian Cultural Association (SCA) and held at the TSC in Brunswick. The SCA thanks the TSC for their impeccable cooking standards and in particular their well renowned hospitality, looking forward to the continued long standing collaboration between the two"